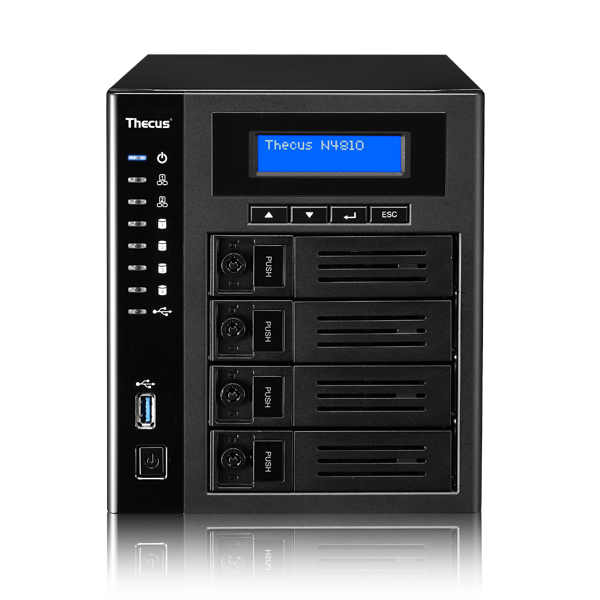 Linux NAS | Thecus N4810 - High-Value 4-Bay NAS. Your Personal Cloud. N4810 High-Value 4-Bay NAS. Your Personal Cloud. 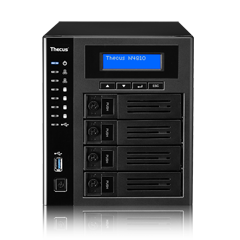 Thecus NAS runs on the newly designed ThecusOS 7.0 offering an easy to use, intuitive user interface. Introducing several new features including Photo Station, Thecus App Center, and User Profile, ThecusOS 7.0 delivers significant improvements in design, performance, and user experience. Delivering superb sharpness and colour contrasts in 4K resolution playback, accessed through the HDMI output or DisplayPort output, guaranteeing that the picture quality from movies is just as the director envisioned. Connection to your digital sound system via a SPDIF output is available, providing crystal clear audio for music and movies. ers severalfeatures including webcam monitoring,timeline view and snapshot. 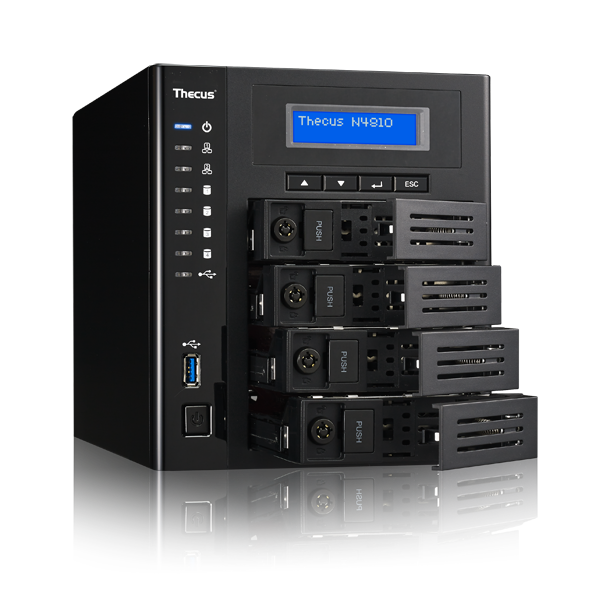 Thecus today announced the release of the N4810, an expanded 4-bay version of the N2810PRO that will come equipped with 4 GB of DDR3 RAM (expandable to 8GB) and the Intel Celeron N3160 Quad-Core processor. This new attractively priced 4-bay NAS server is capable of up to 40TB of storage space, making it the ideal choice for home and small office users seeking solid data protection with their own personal cloud, in conjunction with an optimized Multimedia centre. 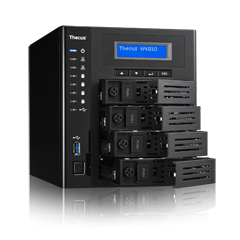 The N4810 runs on the latest ThecusOS 7.0, providing an optimized, feature-rich platform with a redesigned intuitive user interface and easy navigation. Key new features include Photo Center, File Center and Thecus App Center, an extensive variety of apps for modern digital lifestyles are ready to be accessed upon hardware installation. ThecusOS 7.0 delivers significant advancements in productivity, flexibility, and performance. The N4810 substantially raises the redundancy rate in contrast to the N2810 series, with two extra bays the N4810 can cater for larger RAID configurations (RAID 0,1,5,6, 10 and JBOD). With greater RAID levels, improved performance and data protection is ascertained. 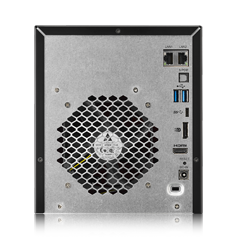 The N4810 provides the essential services demanded of a NAS, with uncompromising data integrity, high-speed data transmission at home or in the office place, with immersive multimedia functionality. 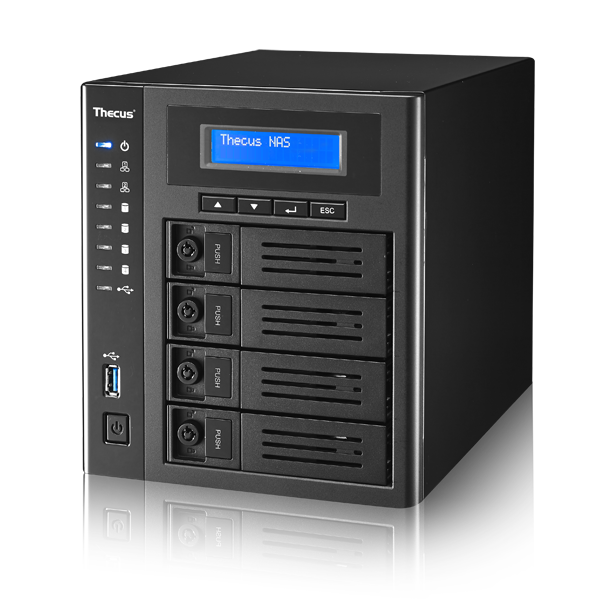 A worthy successor that will cater nicely to the middle of the range NAS market. Availability: The N4810 will begin shipping globally in August 2016.